In the end, AzhwAr says “Those who learn this decad can enter paramapadham (spiritual realm) where they can eternally be united with emperumAn“. Subsequently, AzhwAr mercifully explains that the result of meditating upon this decad and becoming overwhelmed with joy is to ascend to paramapadham. vaikuntham ERuvar – will ascend to paramapadham (where there is unlimited enjoyment). nammAzhwAr, who is having great family lineage, who is the leader of AzhwArthirunagari, which is having group of mansions, due to great desire to enjoy, which is an inherent aspect of the svarUpam and is firm, sang thousand pAsurams in dhrAvida (thamizh) language which is available to be pursued by all, in the form of distinguished teachings, on sarvESvara who is having infinitely enjoyable divine eyes which are the cause for such desire to enjoy him; those who have this decad among those thousand pAsurams without missing anything, fixated in their heart, who are able to sing and dance with great emotions will ascend to paramapadham. thazhuvi ninRa kAdhal thannAl – My love which cannot be given up even if said “I will give up”, which always accompanies me. thAmaraik kaNNan thannai – AzhwAr is identifying the eyes which worked to cultivate this love in him for emperumAn. kuzhuvu mAdath then kurugUr – As said in SrI rAmAyaNam yudhdha kANdam 127.5 “sarvancha kuSalam gruhE” (everyone is well at home), the whole of AzhwArthirunagari was overflowing with many who consoled each other saying “As AzhwAr‘s desire/sorrow is increasing, it is only a matter of time before sarvESvara arrives here”. mARan – One who changed samsAram (material realm) [to become devoted to emperumAn]. satakOpan – One who is enemy for those who turn away from bhagavAn. sol vazhuvilAdha – Among thousand pAsurams, this decad which is spoken (as good instructions to be heard by everyone without discrimination) without missing anything in this auspicious calling out in separation from bhagavAn. thazhuvap pAdi Ada vallAr – AzhwAr’s pure mood and actions cannot occur in anyone else; if one can recite this decad even with slight emulation of such mood (those who can dance with such emotions). 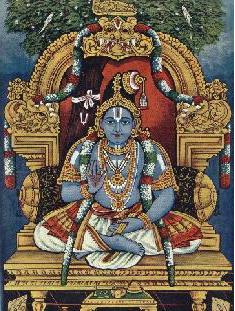 vaikuntham ERuvarE – Giving up this samsAram where one can only call out with desire to see him, will ascend to nithya vibhUthi (paramapadham) where there is eternal enjoyment. kuzhuvu mAdam – closely built mansions. thenkurugUr – also explained as, beautiful AzhwArthirunagari. This entry was posted in thiruvAimozhi, thiruvAimozhi 4th centum on March 25, 2017 by Sarathy Thothathri.